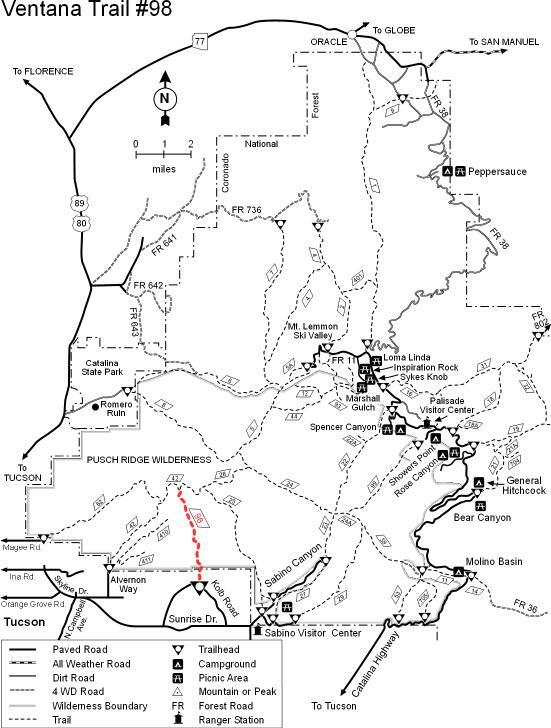 I originally started this hike with the intention of doing the Ventana Falls Loop, which another HAZ hiker named Lizard had described. 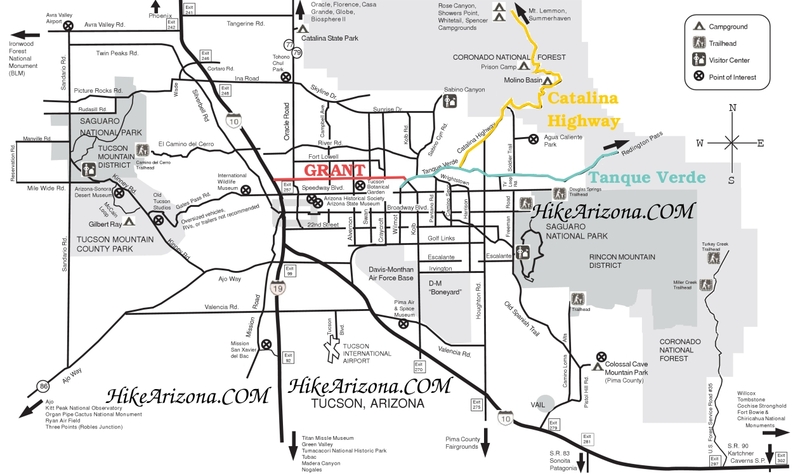 Lizard had stated that if there were a heavy flow of water crossing the Ventana Canyon trail after the wilderness boundary, the Ventana Falls would be spectacular; however, the off-trail canyon route of getting there might be impassable. Well, about 100 yards from the trailhead the water was gushing. The gate for the wilderness boundary was still a mile up the trail. I knew I was in for a treat and just decided to forget about the impassable part. As I hiked up the trail, I trudged through the rushing water several times as it crossed the trail. At the 1.75 mile point, I departed the trail as per Lizard's instruction to pass through the impassable. The first pool I hit was easily over 5 feet deep and demanded climbing to get out of it to the next level. Nothing like being wet and clinging to slippery rock with the tips of your fingers. Here, at least, worst case scenario was that I was going to plunge into the pool. I made it, and it was a day in the park compared to what was to come. Around the 2 mile mark, I came upon the granite slickrock that Lizard mentioned and tooled around there for a while. It was here where I reached for a crevice to grip and discovered a young Sonoran Whipsnake who already called it home. Also, this is where I departed from Lizard's route. Shortly before the slickrock there is a "Y" in the canyon. The slickrock is to the left. You could ultimately follow that route up to the Maiden Pools. To the right is what I have only found labeled as Ventana Canyon Wash. I crossed over from the slickrock to Ventana Canyon Wash. The wash was quite vertical, gushing with water, and was much like an obstacle course. Sometimes I would cross through pools and climb up their wet walls to the next level. Other times, I would carefully choose boulders that had fallen down the wash to pull, push, and slither my way up; on a few occasions I did not choose wisely and fortunately avoided injury. In other instances, I had to crawl around waterfalls through body-sized openings between fallen boulders. And yet other times, I would bushwhack and/or slip and slide on loose dirt as I circumvented insurmountable falls. My pace was slow and deliberate. I continued to climb because I could see this really huge waterfall flying off the top of a black cliff in the distance. I named it "Black Fall". It had to be at least 100 feet tall. I also continued to climb because I just didn't want to go back down the way I came. I made myself believe that there had to be an escape route at the top. Just prior to Black Fall, I climbed straight up wedged rocks and boulders for about 25 feet with water pounding down into my face and all over my body. This was a final gatekeeper of sorts. When I made it to the base of Black Fall with its water pouring down a sheer cliff, I assessed a possible escape route up to the west. It was very vertical and very nasty, but I could see the top only a few hundred feet away. I went for it. This was not scrambling; this was climbing. In every section of this adventure, thus far, I had thought so many times that I was at "the end of the road," and then I somehow made it further. That was my plan, here.....and I got so close. I made it to about 20-30 feet of the top, and I could not go any further. As I clung to the rock and looked up and down and up and down forcing myself to realize I had run out of options, it started to rain. Hugging the loose rock of a body-wide crevice on a cliff on the front range of the Catalinas in the afternoon during monsoon season as the rain starts to fall is a little scary. At least the rain was that extra kick I needed to give up on continuing the ascent. It was time to get down and get out of the wash, fast. Thus, I carefully started down with an intense focus. When the opportunity arose, I scrambled out of the wash and over to the slickrock. From the slickrock, I bushwhacked up to the Ventana Canyon Trail, just below the Maiden Pools. I was very happy to be back on a trail and made a loop out of this thing after all! Fortunately, the rain never developed into anything more than a fleeting drizzle. Ventana Wash is a little less than 1.25 miles in length from Lizard's jump off point from the Ventana Trail (1.75 miles from Ventana Canyon trailhead). It's short, but it's harsh. When it's dry, the Ventana Wash is probably a pretty tough scramble and as you get higher, it won't be for everyone. When the water is flowing heavily, as it was on 04 AUG 2007, it is extreme and very dangerous. In nearby Sabino Canyon, two other hikers lost their lives on this day due to flooding; 22 others were rescued by helicopter from the Seven Falls trail. At Ventana Wash, the pools and various falls, especially Black Fall, were very cool; however, I was glad to be done with this "hike" and do not recommend it to anyone when the water flow is heavy and there are clouds overhead. 6) Ventana Trailhead Parking is on your left. It is a large slender lot. Trail takes off from the end. If you continue to far on N Resort Dr you will quickly enter the resort on Flying V Rd, turn around.